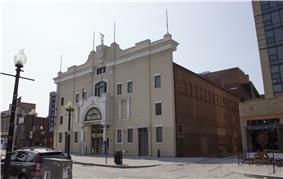 Constructed in 1910, the theater was founded and owned by the National Amusement Company, a white-owned group. When built, it had a capacity of more than 1,200. Designed by J. Edward Storck, the theater featured orchestra and balcony seats and eight proscenium boxes, with a lavishly decorated interior. No less extravagant was the exterior, which combined elements of the Beaux-Arts, Italian Renaissance, and neoclassical styles. The whole was surmounted by a larger than life statue of Apollo playing his lyre. Howard Theatre at 620 T Street NW, with inset of manager, Andrew J. Thomas (ca. 1910-1919). Interior of the Howard Theatre at 620 T Street NW, ca. 1915. Andrew Thomas served as the theater's manager during its early years. Beginning in 1922 it was leased and run by actor, producer, and entrepreneur Sherman Dudley. It was taken over in 1926 by Abe Lichtman, the white owner of a chain of movie theaters that were frequented by blacks. With the onset of the Great Depression, the building became a church for a time under the direction of Elder Michaux. In 1931, as part of the venue's return to its original purpose, Duke Ellington appeared with his band at "the Howard," helping also to cement the theater's reputation as an entertainment hotspot. This rebirth was helped along by Shep Allen, the building's new manager. In the 1930s Allen introduced an amateur contest that was used as a springboard to stardom by Billy Eckstine and Ella Fitzgerald. The Howard Theatre lost its original ornate facade in 1941 when it was redone in the then-fashionable Streamline style. Franklin Delano Roosevelt and his wife Eleanor would attend balls at the theater during World War II. These balls featured performers like Danny Kaye, Abbott and Costello and Cesar Romero, among others. Also in the 1940s, Pearl Bailey made her debut at the Howard Theatre. ^ a b c Ganschinietz, Suzanne (30 August 1973). "National Register of Historic Places Inventory – Nomination Form / Howard Theater" (pdf). ^ a b c d e f g h i j k l m n o p q "Howard Theatre". African American Heritage Trail Database. Cultural Tourism DC. Archived from the original on 2006-10-18. ^ a b c "Howard Theatre Renovation Begins with Groundbreaking". borderstan.com. 3 September 2010. ^ Dobson, Amy Rose (28 February 2012). "Howard Theatre Re-Opens This April With Many Famous Performers Scheduled To Appear". ^ a b c "Howard Theatre". Martinez + Johnson Architecture. Retrieved 2013-03-23. ^ Coburn, Randy (29 October 1978). "At the Howard: The Search for a D.C. Legend". ^ "Howard Theatre Restoration Inc. Unveils Plans for Theatre and Invites Community to Document History" (pdf) (Press release). Historical Society of Washington, DC. 22 February 2007. ^ Howard Theatre Gala Re-Opening Program. New Howard Theatre Corporation (found at Historical Society of Washington, DC library). 1975. ^ "Most Endangered Places for 2002, Historic Theaters". DC Preservation League. Archived from the original on 2002-12-02. 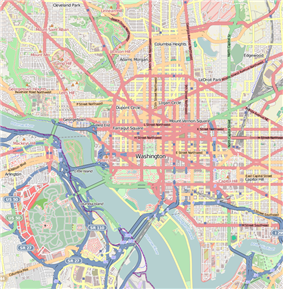 ^ "Monday: Howard Theatre Community Day". borderstan.com. 8 April 2012. ^ "Howard Theatre Reopens with a Party". borderstan.com. 12 April 2012. ^ Murph, John (8 April 2013). "Howard Theatre: In a year since its reopening, has it brought the 'magic' back?". After a $29 million renovation, the theater reopened for Community Day on April 9, 2012. The grand opening event was held on April 10. Since its opening, it has hosted a diverse lineup of well-known acts, including Anthony Hamilton, Raheem DeVaughn, Chrisette Michele, Tamia, Dianne Reeves, Gregory Porter, Esperanza Spalding, José James, The Roots, Slick Rick, Drake, Chaka Khan, Aaron Neville, and Sheila E.
The DC Preservation League listed the Howard Theatre as one of its Most Endangered Places in the city in 2002. In September 2010, groundbreaking for extensive renovations of the theater was held. The project's goals were to restore the Howard Theatre to 600 seats, along with complementing developments at the adjacent Progression Place. Martinez + Johnson Architecture and Marshall Moya Design were responsible for the restoration, architecture, and design of the theater. In 1980, the theater closed again. At the time it was the oldest venue in the country that featured black artists. and the Soul Searchers also performed at the Howard Theatre in the 1970s and 1980s.Chuck Brown and  bands played the venue,go-go Later in the decade,  were among the acts featured at the theater's reopening.Melba Moore and Redd Foxx  In April 1975, the New Howard Theatre Corporation presented an evening of entertainment to salute the re-opening of the theater.